MCEC is the only centre in Australia to offer on-site accommodation, with the five-star Pan Pacific Melbourne and four-star Novotel Melbourne South Wharf directly connected via private internal walkways. A huge range of additional accommodation can be found just a short walk away from MCEC. The building has become an icon in Melbourne due to the main entrance which consists of metal blades tilted at an angle and supported by a pair of yellow rods – it's hard to miss, even among its more prominent neighbours. The airport accommodates a vast airline network with many direct flights and 24/7 operations and services, offering maximum flexibility for delegates. Only 25 minutes from Melbourne’s international airport, your short trip into the city centre is quick and easy with options ranging from our dedicated Skybus (running between the airport and the Southern Cross Station terminal in Melbourne city), to individual passenger services. 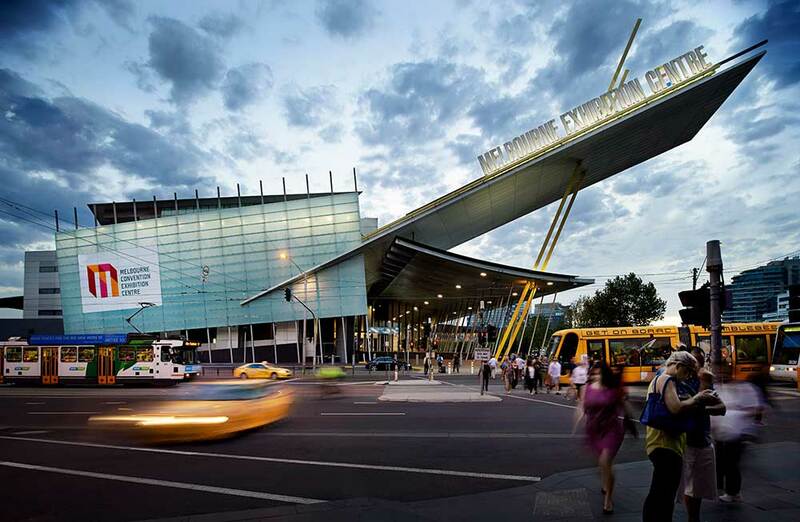 Tram routes 96, 109 and 12 (Stop 124A Casino/MCEC) will all take you directly to the Clarendon Street entrance of the Melbourne Convention and Exhibition Centre (MCEC). Otherwise, tram routes 48 and 70 (Stop D5) take you to Flinders Street. Most trains also stop at Flinders Street train station; from Flinders Street station, it’s a short walk up Flinders Street (or along the scenic Southbank Promenade) then up Clarendon Street until you reach the MCEC. For tram or train timetables and further trip planning, use Public Transport Victoria’s Journey Planner. Please note that the MCEC car park can reach capacity early in the day during busy events. Please note that visa processing times may vary. Delegates are encouraged to apply for the appropriate visa six to eight weeks before departure to Australia. Importantly, it is the policy of the Meeting Secretariat not to supply an ‘invitation letter’ to unpaid or unregistered delegates as it is not required and does not assist in the visa-application process. Upon payment of registration fees, each delegate receives a confirmation letter of acceptance of registration and receipt of payment. If you have any enquiries relating to the Meeting, please contact the Meeting Organisers.